Zircon plays an important role in the search for diamonds. Diamond prospectors have learned to look for certain minerals in the field because they may point to the existence of a diamond-bearing kimberlite deposit. To geologists, zircon is an important diamond indicator mineral (DIM). Both zircon and diamond form deep within the earth and may remain there for millennia before being transported to the surface in rising magma called kimberlite. Kimberlite is a unique type of igneous rock. It contains a variety of minerals with a makeup that suggests they were formed under high pressure and temperatures deep within the mantle. Other igneous rocks do not contain these same minerals. 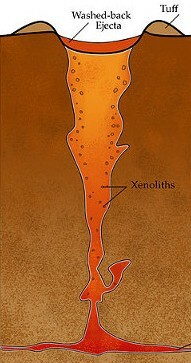 The minerals are not formed within the kimberlite, but are carried by it to the earth’s surface. For this reason they are called xenoliths. When this happens, kimberlite doesn’t flow out of the ground like lava. Kimberlite solidifies at high temperatures and by the time it reaches the surface it is already solid. After the solid rock, ash, and gas explode through the crust, most of the material falls back into place, along with any diamonds, zircon, and other crystals the rocks contain. What’s left is a deep, carrot- or mushroom-shaped pipe topped off with a shallow crater. 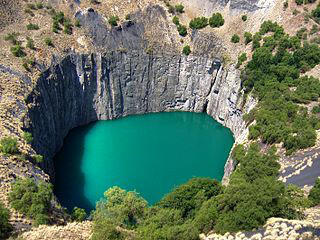 This formation is called a kimberlite pipe and it is the major source of diamonds worldwide. Diamond pipes are not obvious features in a landscape, and their existence may be hidden by other geological features. Diamond pipes have traditionally been discovered by searching stream sediments or soil samples for DIMs that may have eroded out of the pipe. Diamonds too can be found in the streambeds or soil samples, but DIMs are typically thousands of times more abundant than the diamonds themselves. This is why DIMs are an indirect, but efficient tool for locating diamond pipes. When geologists find quantities of DIMs in the field, they attempt to locate their source with the hope of discovering a new kimberlite pipe. DIMs include the following minerals in order of their decreasing significance: garnet, chromite, ilmenite, clinopyroxene, olivine, and zircon. But some DIMs are prone to chemical dissolution, especially in tropical weathering conditions. Zircon tends to persist because it is very durable and can withstand weathering. The order of DIM significance in terms of persistence is zircon, ilmenite, chromite, garnet, chromium diopside, and olivine. Recent advances in diamond exploration include a new technique called (U/Th)/He thermochronology. With this method, researchers can distinguish between hot zircon, or zircon that formed deep within the Earth, and cold zircon, which originated closer to the Earth’s surface. A site with a high percentage of hot zircon would be a prime location to search for a diamond-bearing pipe. To date, about 6,400 kimberlite pipes have been discovered worldwide. 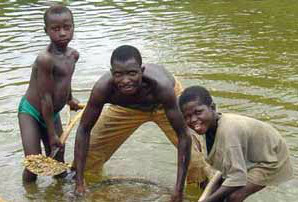 Of that number, about 900 contain diamonds, but only 30 have been deemed rich enough to mine.